I’ve had this blog post about tips for beating procrastination planned for three weeks now. I wrote a (very) rough draft, and I’ve been meaning to sit down and write it properly since then but just haven’t got around to it. Why? Well, you know, I’ve been really busy with other things, the cat always looks like she wants a cuddle and . . . ooh, look at that pretty butterfly outside! Hello, my name’s Emily, and I’m the Queen of Procrastination. 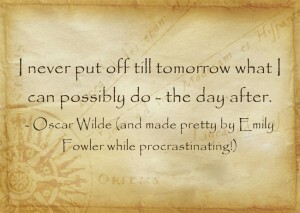 I’m with Oscar Wilde when he said . . .
. . . and yes, I procrastinated for a good 15 minutes finding the right visual for that! Everyone struggles with procrastination at times, and it can affect all aspects of your life. It’s usually easier to allow procrastination into your personal life than in your professional life, because the cost doesn’t seem quite so high. Take me as an example (don’t worry, I have lots of examples of my splendid procrastination skills! ), I’ve been meaning to clear out my shoe cupboard for, well, probably years. There are old shoes, broken shoes, shoes I’ll never wear again, all in one crazy jumble. The benefits of doing it are A) that it’ll be easier to find what I’m looking for, and B) it’ll make my boyfriend happy. But the cost of not doing it? The odd drama when I’m in a rush and throwing odd shoes around in my hunt for a pair, and an occasional grumble from my boyfriend. Ooh, there’s that butterfly again! When you’re employed by someone else the stakes are slightly higher, but it can still be all too easy to fall into the procrastination trap. If you were to ask any of my previous bosses from when I was an employee, they’d probably all have a similar tale to tell . . .
BOSS: Emily, don’t forget that report needs to be done by the end of the month. BOSS: Have you started that report yet? I’m keen to see how you’re getting on. EMILY: Hmm, well, actually I’ve been really busy (gesturing loosely at the even bigger pile of paperwork on the desk). I’m definitely going to get it done this week. BOSS: Can I just have a look at that report please? EMILY: Can’t talk . . . got to get this report done . . . aaargh. I was lucky, I didn’t get the sack, because I always got things done, but often at the last minute and at the detriment of my sanity and free time. I used to tell myself that I work better when I’m under pressure, but in all honesty that was just an excuse. If you’re self-employed or run your own business, this is where procrastination can really have a negative impact, and this is how I learned how important it is to beat procrastination. When you’re your own boss, you don’t have to make that call to a prospective client, or investigate that supplier or do that work on your website, especially if the park or Facebook or the cat is calling to you, but it’s your profit that’s at stake here. You may think you have all the time in the world, but when it’s your business . 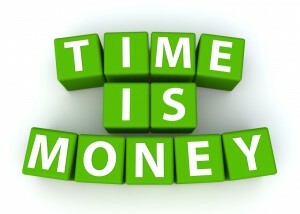 . .
Time is money, YOUR money! And not just money, but YOUR money. Reward yourself. Now this is my personal favourite; promise yourself a reward once you achieve a certain target. When I first decided to do this I’d been browsing TripAdvisor looking at restaurants in Amsterdam. I set myself a target of working for X hours straight, then actually booking the holiday to Amsterdam! Obviously I realise that booking holidays as a reward isn’t really financially viable as a regular reward, but I also use much smaller ‘rewards’, like having a sit down with a cup of tea for half an hour. Whether it’s reading another few chapters of a book, going out for lunch or booking a weekend away – big or small, if it’s something you enjoy then use it as a reward. Accept your tendency to procrastinate. Don’t hide from it, remind yourself that you have a tendency to procrastinate and try to beat it. With a big stick, preferably. 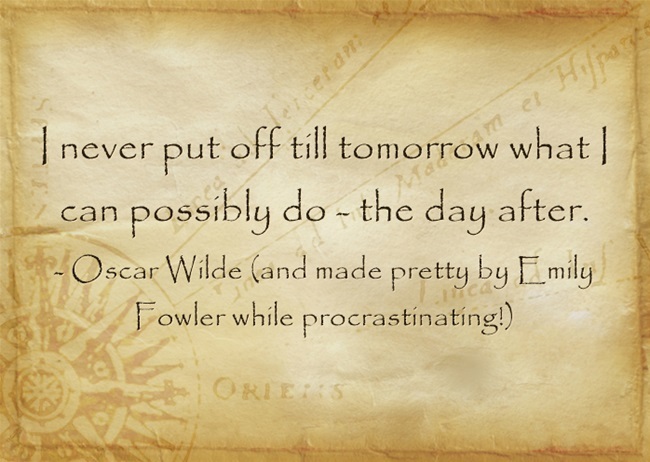 Perhaps choose your favourite anti-procrastination quotes, write them on post-it notes and stick them up around your usual procrastination hot-spots, or your desk. Work out the financial cost of procrastination. 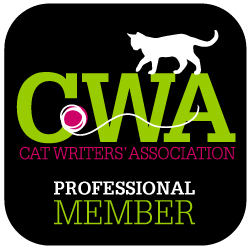 For example, as a writer, I know what my average ‘hourly rate’ is, so by adding up all the minutes spent procrastinating I can see what it’s actually costing me in monetary terms. Ignore your inner excuse-maker. ‘But I work better under pressure’, ‘I’ll be more focussed tomorrow’. You know full well that these are only excuses. Focus on the outcome. Whether it’s the reward you’ve promised yourself after you finish a big project, or the result you know you’ll get after completing a smaller task, looking forward to what’s ahead can often help in the battle to beat procrastination. So now I’ve finally written this post, I’d love to know whether you’ve got any of your own tried and tested tips for beating procrastination? Now onto that shoe cupboard . . . did somebody say butterfly?